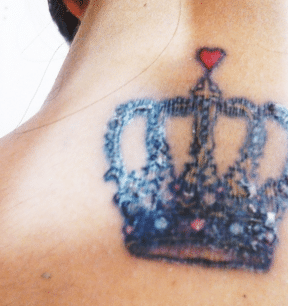 A critical look at the tattoo healing stages, scabbing, peeling and the problems as well as the after care products of the tattoos. During the tattoo healing process the tattoo should be treated right to avoid experience of infections or loss of color. There are a few tattoo healing stages of tattoo healing and after care tips to ensure a good looking tattoo. Remember that the total healing time required for a tattoo to completely heal ranges from three to four weeks. This stage begins as soon as the tattooing has been finished which would initially be treated as an open wound. You are supposed to cleanse the area around the tattoo at least twice a day and applying fresh bandages after each cleansing. The bandages will be important as they catch any fluids and excess ink. During this stage, the tattoo will be swollen and red on the edges, you might find bruises around the area. This is normal and indicates that the tattoo is healing. Scabs will start forming over the tattoo and thus it is not important not to pick. Use a gentle soap to cleanse the area. This is the most initial of tattoo healing stages. The tattoo starts to be itchy. The stage is approximately a week. The stage is also annoying and indicates the skin naturally recovers. The skin takes about a week for the skin to start regenerating. About four days after the start of the itching the skin will start to peel making the itch to worsen. The tattoo will look as if translucent or with a white film which is a layer of the healing skin that hasn’t absorbed the same amount of ink. This is the final stage of the tattoo healing process. The tattoo appears mostly healed. At this stage, all the scabs are gone and the ink should be settled. The main tattoo is however, deep in the skin. The tattoo will start to look very vibrant and this is normal for the final stage of the tattoo healing. It is advised that you continue cleansing the tattoo and even lotion the tattoo at least twice in a day to prevent the tattoo from overdyeing. Do not attempt to peel off the final layer as it may damage the tattoo. Moisturizing will take care of the over drying naturally and may encourage the remaining scabs to fall off on their own. If the skin is very dry, then you can also moisturize it mote often to reduce this. Before you think of having that tattoo healing, you should ensure that you chose a tattoo artist who is reputable so that you get a tattoo that you are proud of. How to care for your tattoo is equally important during the tattoo healing stages as even a good quality tattoo can be ruined by poor aftercare. Though the guidelines will vary from one artist to another but the overview of it all is that you try to keep that tattoo clean, bold and clear. After doing a thorough research about the best artist in town and chosen him or her, he will provide instructions on how the tattoo can be cared, instructions that you should keenly follow. Every tattoo artist will have a different opinion on the best after care but the important thing is ensuring that you follow the instructions carefully as required. Due to the many years of experience for many tattoo artists, they will be able to advice you on the methods that have been tried and tested. As much as the instructions will vary from one artist to another, the advice should act as a guideline for the healing of the tattoo. Once the procedure has been finalized, the artist will clean the area with an anti-bacterial ointment and cover the tattoo area with a bandage or any other dressing. Avoid the urge to undress the area as it protects you from the airborne bacteria that can penetrate through your broken skin. The bandage should be left on for about 6 hours before you remove it. Thick, non-absorbent ABD wound dressings are the most common type of the bandage that your artist may use because they are very effective and allows the tattoo to breathe while also being very thick to protect effectively the skin from the bacteria and bumps as much as they are extremely absorbent. Proponents of the plastic wrap strongly believes that it is the best way to wrap new tattoos in plastic wraps without sticking it to the skin. 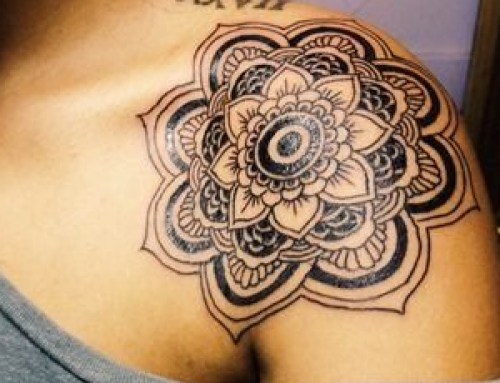 That it also forms effective shield that blocks the bacteria from getting near the tattoo. The opponents of the plastic wrappings believe that the plastic wrappings prevent oxygen from getting to the tattoo and that oxygen is essential. It also seals in moisture and raises the temperature of the skin creating the perfect environment for the growth of the bacteria. But the important thing is however, whichever covering that the artist may decide to use, just be sure to follow his advice as much careful as you can. Both types of covers have successfully as before. Remember that plastic wrap has to be changed and the tattoo should be cleaned more frequently than with other bandaging so that the bacteria will not build up. Depending on the advice of the tattoo artist on how long the bandage should remain in place, most artists agree that the tattoo should be covered for at least 2 hours before the removal but the recommended time varies from 4 to 6 hours. Tattoos covered in plastic wrap are the exception as plastic wrap should never be left on new tattoo for longer than 2 hours. To remove the bandage, soak it carefully in warm water as this prevents it from sticking to the skin and comes out easily once wet. Discard the used bandage. It is recommended that lukewarm or mild water is used in all the tattoo healing stages. You can also use unscented anti-bacterial soap as it helps to prevent the tattoo from scabbing too soon. Do not use any washcloth or sponge to clean the tattoo as it may contain the bacteria eventually spreading it to the tattoo. After thoroughly washing the tattoo, then you should pat gently with a little paper towel. Rubbing should be avoided as it irritates the tattoo. Once the excess moisture has been done away, then you should leave the tattoo uncovered for about 1 hour to allow the tattoo breath and any moisture that was excess to evaporate. Ointment application should be at least 2 times a day after washing for 3 to 5 days until the peeling of the tattoo starts to peel. Wash the tattoo continuously until with an antibacterial soap until the tattoo is fully healed. This can take up to 6 weeks depending on size as well as the location of the tattoo. Tattoos should be washed to approximately 3 times a day though should be washed more on areas that are easily exposed to germs. Tattoos are supposed to scab at any stage of the tattoo healing stages and it is very normal for it to scab. When they are scabbing, don’t do anything. Submerging of the tattoo in water for a long period of time. 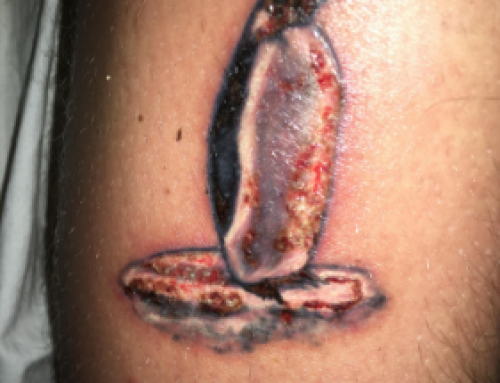 It is normal for scabbing to start occurring after any period of time of the tattoo healing stages within the agreed timelines. If you suspect the tattoo is infected, then you should consult a doctors who may prescribe antibiotics to help fight the infection. Scabs may not necessarily imply that your tattoo is infected during the tattoo healing stages, though also the infected tattoo will also scab and weep fluid and even look red. The scab serves the valuable purpose of protecting the wound from bacteria while white blood cells work vigorously underneath to kill any germs that get through the crusty layer. White blood cells also help heal and repair the new skin forming underneath. Do not pick, scratch or pick at the tattoo as it may begin to scab. Scabs should be left normally to dry out and eventually fall off themselves at any stage of the tattoo healing stages. Do not help the process as it may cause the scabs to fall off prematurely leaving holes or light spots on the tattoo. It may also cause the tattoo to be infected especially if the hands are unclean. Always remember to wash your hands with antibacterial soap before touching of the tattoo and never allow anyone else to touch the tattoo. Scabbing and peeling off of the skin can sometime be very itchy but remember that scratching can lead to falling off of the scabs, you can relieve the itchiness by slapping with a flat of the hand or by rubbing with a little lotion. Moisturize the ointment to combat the itchiness if it is the problem. Do not soak the tattoo by avoid various things that will moisten the tattoo like swimming in the pool or sea or even in the bathtub. Exposing the tattoo to water may draw the ink out of the skin damaging the appearance of the tattoo. It is completely safe to resume the water activities once the tattoo is completely healed but you should stick to rinsing of the tattoo in the sink. Avoid exposing the tattoo to direct sunlight as the harsh rays of the sun can cause the skin to bleach some of the colors from the tattoo. It is advised that you keep the tattoo covered and away from the sun for at least 6 weeks until the healing is completed. After the healing, you still need to protect the tattoo by wearing something that will prevent the tattoo from fading in the sun and keeping the colors in place and for longer. 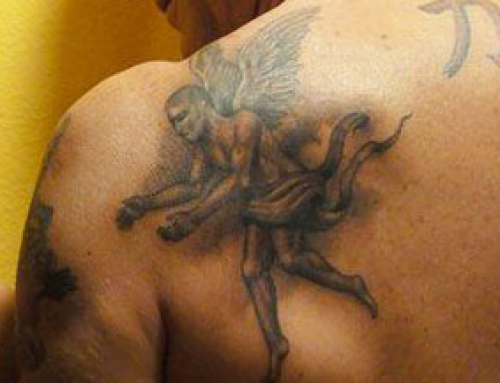 Avoiding of tight fitting clothes is an important measure to ensure that your tattoo heals. As the tattoo heals, it sips the plasma and even the excess ink that can cause the clothing to stick to the tattoo. The clothing becomes painful to remove and can rip off the freshly formed scabs. If the clothing sticks to the tattoo, do not pull but wet the area with water, it loosens the clothing and it can now be removed without damaging the tattoo. Always wear clean, loose fitting clothing all times while the tattoo is healing. Avoid working out your body as tattoos that cover large surface areas or near joints may take longer to heal especially if the skin is forced to move around too much especially during the intense workouts. The movements causes the skin to be irritated hence prolonging the period of healing of the tattoos, thus you should avoid unnecessary physical activity. Avoid washing of the tattoo with hot water as the hot water will open up the pores and may likely hurt the sensitive skin. During the entire tattoo healing stages, always use a cold gel pack, it is the best alternative to the traditional ice pack. At night when you are sleeping, do not lie on the tattoo side as the ink may come off. Also ensure that you lay a towel underneath to absorb excess ink that may drain when you are sleeping so that the ink do not stick on the bed sheets. Running an itchy tattoo under hot water for a few minutes will enable you have the comfort to sleep for a while without feeling the itchiness of the tattoo. Cold may sometimes help get rid of the itch. Gently rest an ice pack on the tattoo. Diseases and viruses may be spread through the process of tattooing, remember to get services from a reputable shop. Avoid usage of such products as Neosporin as they are not meant for puncture wounds and they will cause the skin under and around the tattoo not to heal too quickly. Tattoo aftercare moisturizing lotion; most lotions have different use, so a person should be careful when choosing a lotion. Do not choose a lotion that has large amount of petroleum and alcohol as it will damage your tattoo. Do not use too much of any lotion. If the product is sensitive to your skin, then discontinue use and seek medical advice. Tattoo aftercare antibacterial lotion; some antibacterial lotions may also end up harming your skin as opposed to helping the healing of the tattoo. However if works well on your skin, apply a small amount on the skin and be conservative. Sunscreen; this is an essential lotion of the aftercare products, after the fading of the skin, there is no way for it to regenerate the original colors of the ink as the compounds that cause the colors are recycled by the cells of the skin.